From luscious apricots and honey, to fig, basil and caraway seeds. 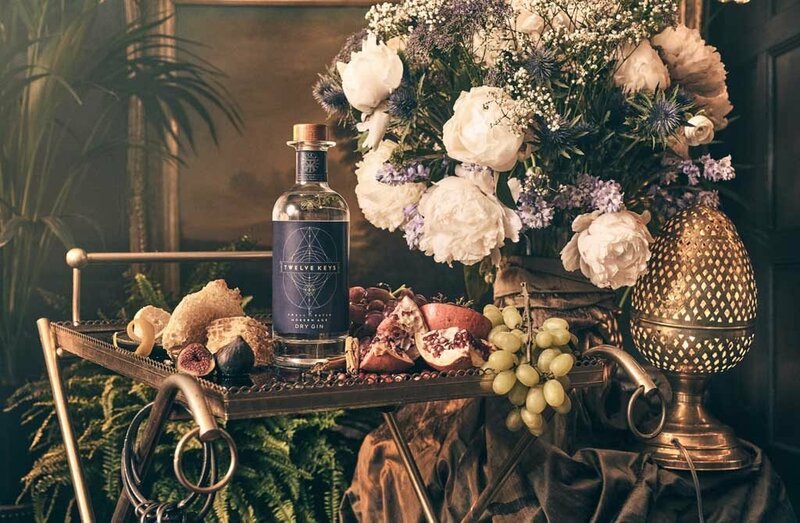 The twelve botanicals in Twelve Keys Gin were chosen to reflect four moments in time in early alchemy, with each moment inspired by the journey of alchemy over one millennia, and core to the story of Modern Gin. Each moment, or quarter, is represented by a trio of relevant botanicals, with each botanical playing a vital role in linking both flavour and the deeper alchemic concept of Twelve Keys; taking something essentially simple, and making something really special, through a journey of mind and soul. The first quarter represents early distillation through the cult of Bacchus, the god of wine and revelry. Grapes were Bacchus’ gift to mankind, and for his worshippers, distilling, consuming and embracing wine and all things indulgent during ritual madness was thought to accentuate his power and allow worshippers to be closer to their deity. Figs, Apricot, Quince are a nod to this era and the early history of these intrepid alchemists and imbibers. Early distillation was not just about medicine, or even flavour, but ritualistic, indulgent eating and excessive drinking! The second quarter respects the early Persian and Arabic alchemists, who whilst didn’t invent distillation, took rudimentary, science, basic apparatus and ritual, and transformed these into much more advanced techniques, such as with the alembic still, and creating Rose Water. It is where Basil Valentine has his origins and is a nod to this exile and revolutionary era in alchemy’s travels. Honey, basil and caraway seeds are relevant to Persian cuisine, and bridge between feasting celebrations and perceived medicinal properties. The third quarter moves away from the mystical to the medical, where travelling scholars and doctors relied on alchemic practices to extract essential oils from ingredients. Some believed they could distill the quintessence of a plant and capture its very soul, as with Aqua Vitae (water of life). Many popular tinctures from this era, such as Jägermeister, Chartreuse and Suze can still be found today. Orris Root has a mythical status amongst distillers in binding flavours, whilst Angelica and Gentian both have a long-standing medical uses. The fourth quarter relates to the earliest records of Gin, dating back to scrolls from the 3rd or 4th century AD. Cathar priests would create a concoction of increasing potency to be consumed by believers, using Juniper, Cinnamon, Frankincense. They may have imbibed, inhaled or even placed this concoction on the skin and then set fire to it, which tells us that it must have been a distilled spirit of sufficient ABV to catch fire. Once juniper was added, it was technically an early Gin, even if unintentional! Through the journey of mind and soul of the early alchemists and their search for enlightenment, we complete our circle of four quarters; the essence of Twelve Keys.